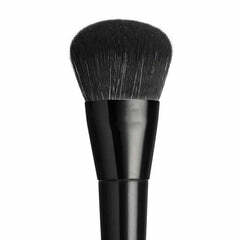 For that angelic healthy-faced look, this professional couture brush will rise to the occasion. You can use it to apply foundations, bb creams, primers, contouring creams and concealers all over the face and neck. It’s big enough to cover the face quickly, but small enough to reach those crevices around the nose and eye area. Overall, you’ll experience a polished, high-definition look. The premium bristles are made from the highest-quality synthetic hairs, so no streaks - just a flawless application and a magazine-worthy airbrushed finish. 18cm full length. Bristles - 2.8cm high, and 3.2cm wide.